Although this video is 2 months old and has over 1.1 million views, I figured there might be a few of you left who haven’t seen it. 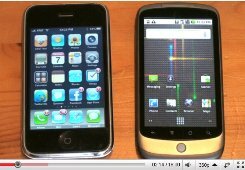 It’s a great video that shows a side by side comparison of the Nexus One Google Phone vs the iPhone. I would say that in the end, the Nexus One comes away the winner. The iPhone, however, got a solid jump on the Nexus One in the marketplace and is empowered by a stronger brand.